For many Americans, the cost of lifesaving insulin is simply too high, leading as many as one in four to ration the drug, experts testifying before the House Committee on Energy and Commerce said this week. The meeting focused primarily on defining the problem and exploring potential solutions, such as lowering the list prices of insulin and increasing transparency so that anyone can see who is paying what in the complicated insulin supply chain. “The price of insulin has doubled since 2012, after nearly tripling in the previous 10 years,” said Rep. Diana DeGette (D-CO), co-chair of the house Diabetes Caucus. “We’ve been hearing stories and reading disturbing news reports for too long. People are skipping doses, failing to pay rent or buy groceries, and even resorting to an insulin black market to afford their insulin,” she noted. What’s behind the stunning rise in insulin prices? That’s not yet clear. The American Diabetes Association (ADA) formed a working group to try to tease out the root causes behind the soaring prices. The ADA’s group found there was little transparency in pricing throughout the insulin supply chain. Dr. William Cefalu, chief scientific, medical and mission officer for the ADA, repeatedly called for increased transparency during the meeting. Right now, no one knows exactly how much each intermediary (wholesalers, pharmacy benefit managers and pharmacies) in the supply chain benefits from the sale of insulin. Information about how much manufacturers end up getting paid for insulin also isn’t publicly available. The current system encourages high list prices (and that’s the price someone without insurance or who has a high deductible is often stuck paying), according to experts testifying at the meeting. He explained that, as a physician, he has no idea what his patients will be asked to pay when he writes a prescription. Even with electronic health records, that information isn’t available to him. 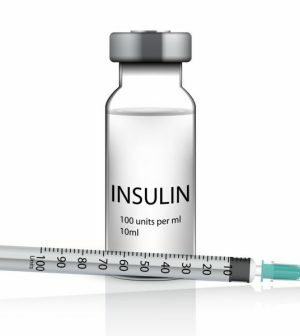 PhRMA, a trade industry association for the pharmaceutical companies, has proposed several solutions to make insulin more affordable. One suggestion is to offer insulin with a flat co-pay. Another is to exclude insulin and other medications for chronic disease from the deductible in high-deductible health plans, and begin paying for those medications before a deductible has been met. The group also recommends reforming the current rebate systems, and when rebates are available, they suggest those payments should be passed directly on to patients. And on Wednesday, pharmacy benefit management giant Express Scripts announced that out-of-pocket costs for insulin could be restricted to $25 a month for people under a new drug benefit plan. The average monthly savings for workers whose employers adopt the company’s plan would be about $16 a month, The New York Times reported. In the meantime, patients’ stress levels rise. Christel Marchand Aprigliano, CEO of the Diabetes Patient Advocacy Coalition, has type 1 diabetes, which means she needs insulin to survive. She testified that in 2011, she paid a $40 co-pay for a vial of insulin at the end of the year. The next month when she went to pick up the very same vial of insulin from the pharmacy, the cost was $1,269 because her family had switched to a high-deductible health plan. More recently, her husband was unexpectedly laid off from his job. She applied for a patient assistance program from her insulin manufacturer. They told her she didn’t qualify, because the required paperwork relied on past income. Her current income was zero. She appealed. They told her they would make a decision in four to six weeks. She cannot go a single day, even hours, without insulin without risking complications and putting her life at risk. And, it’s not just the immediate physical concern, she said. Wondering if she’ll have insurance from month to month or if she can pay for insulin even with insurance — “It’s psychological torture we go through every month,” Marchand Aprigliano said of people who are dependent on insulin. Aaron Kowalski, chief mission officer of JDRF (formerly the Juvenile Diabetes Research Foundation), recommended that manufacturers lower list prices, that rebates need to be eliminated and that there should be a flat, fixed dollar co-pay that everyone pays. Kowalski said solutions need to “reflect insulin’s role as a lifesaving and life-sustaining drug.” He added that people are hurt in many ways by high insulin prices — these costs make it hard for people to pay their mortgage and car payments, send their kids to college and to stay out of debt. Rep. Dr. Michael Burgess (R-TX) suggested that Medicare and Medicaid should consider simply covering the cost of insulin. One reason may be that the potential complications from people forgoing insulin can be quite costly. Several experts in the meeting noted that prices aren’t so high in other countries. Lija Greenseid, a Minneapolis mom of a 13-year-old daughter with type 1 diabetes, experienced this firsthand. Her family traveled to a number of countries and had to purchase insulin while on their trip. The prices varied significantly from what she paid in the United States. Prices vary in the United States depending on the pharmacy and insurance, but she said she has paid up to $700 for a box of insulin pens. That same box (five insulin pens) cost about $73 in Germany (based on 2017 exchange rates), $57 in Israel, $51 in Greece and $61 in Italy. Greenseid noted that people in those countries may pay even less than she did because that was the price they paid as foreign travelers without insurance in those countries. “It’s completely outrageous what we pay here. Insulin is so much less expensive in every other developed country and so much easier to obtain. It doesn’t have to be this way. We are uniquely burdened by this problem in the United States,” Greenseid said. The same House committee is scheduled to hear from pharmaceutical companies, insurers and pharmacy benefit managers next week. Learn more about insulin from JDRF.